Another week has passed and I must admit that it was not a very good training week. I felt tired and there were times that I am just not into a running mode. I was not able to follow my training plan to the letter and was 20km short of my planned distance for the week. I guess, the aggressive build up in mileage in the last 3 weeks had me stressed out. I guess it was a sign to hold back and took some time to rest. There was no bike training last week as well and just focused on running. I did two weekday run (11k each) and one Long Run (21k). Surprisingly, I did get a PR for a 21km run, I finished at 2:24 last Sunday. It was a 10 minute improvement from my best 21k which was during the Ayala Eco Dash held last year. Thanks to Jay for pacing with me. Hopefully I get to beat this time and set an official PR at the Condura Run. Speaking of Condura Run, this will be my anniversary run as I officially joined run races in the 2009 Condura Run where I ran my first 10km. I was hoping to do a full marathon for this event, but I have been nursing an injury after my first marathon in Bangkok in November 2009 and decided not to risk getting injured again this year. I still have some discomfort in my left hamstring but I am lucky that I can run and managed to build some mileage. I do hope that on Sunday, the injury will not go back and continue training for the next events. 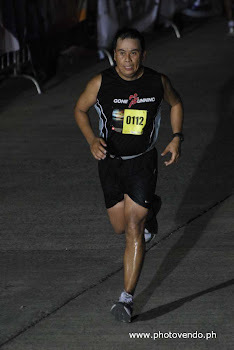 This year, I am glad that more of our employees at CCAC (Concepcion Carrier Airconditioning Company), a sister company of Concepcion Industries Incorprated (CII), are joining the Condura Run as runners. Most of them who are new to running will be joining the 3km race, those who ran at 3km last year are running 5km this year, and some of the 5km runners will do the 10km run. Mike (Aftermarket Sales Director), and Ric (EHS Manager), will be running their first 21km. Hopefully they find running as a means of their fitness activity and becomes a part of their daily routine. I'm sure some, if not all of them will be bitten by the running bug. Meanwhile, most of us in the Gone Running Club will be running the 21k, and 3 of them will be running the full marathon. Good Luck to you guys! I still have a week to do some easy runs and hopefully no injury gets in the way. I think I am ready on Sunday. Will try to enjoy the run and just let my legs bring me to the finish line with a new PR. To those running at Condura Run, see you all on Sunday and Good Luck!